Johann Reinhold Forster (22 October 1729 – 9 December 1798) was a Reformed (Calvinist) pastor and naturalist of partially Scottish descent who made contributions to the early ornithology of Europe and North America. He is best known as the naturalist on James Cook's second Pacific voyage, where he was accompanied by his son Georg Forster. These expeditions promoted the career of Johann Reinhold Forster and the findings became the bedrock of colonial professionalism and helped set the stage for the future development of anthropology and ethnology. They also laid the framework for general concern about the impact that alteration of the physical environment for European economic expansion would have on exotic societies. Johann Reinhold Forster and Georg Forster in Tahiti, by John Francis Rigaud (1742–1810), 1780. Forster's family originated in the Lords Forrester in Scotland from where his great-grandfather had emigrated after losing most of his property during the rule of Oliver Cromwell along with many other Scots. Forster himself was born in the city of Tczew (Dirschau), in the province of Royal Prussia, in the Crown of Poland. He studied languages and natural history at the Joachimsthal Gymnasium in Berlin, theology at the University of Halle, afterwards serving as a Protestant pastor in Mokry Dwór (Nassenhuben) Pomeranian Voivodship. He married his cousin Elisabeth Nikolai. They had several children including a son, Georg Forster and a daughter Virginia Viktoria. In 1765 he accepted an offer made to him by the Russian government to inspect and report upon the new colonies founded on the banks of the Volga, in the province of Saratov. His irritable temper soon involved him in difficulties with the Russian government, and in the following year he went with Georg (the eldest of eight children, seven of which survived childhood) to England and became teacher of natural history at Warrington, Lancashire. He spent three years teaching at the Dissenting Warrington Academy, succeeding Joseph Priestley. Compelled by his violent temper to resign this appointment, Forster then moved with his son to London, where they earned a precarious living by doing translations. In 1771, he published A Catalogue of the Animals of North America, which listed the region's mammals, birds, reptiles, fish, insects, arachnids, and crustaceans. When Joseph Banks withdrew at the last moment as naturalist on Cook's second voyage, Forster and his son were appointed to fill the vacant position. In July 1772 they set sail on the Resolution, returning to England in July 1775. During a stop in Cape Town, Forster engaged Anders Sparrman to act as his assistant. Both the Forsters kept detailed diaries of everything they saw on the voyage, and made extensive collections of both natural history specimens and artefacts. On his return Forster published Observations Made during a Voyage round the World (1778). However the income from the book was insufficient to clear his debts, and the bulk of Georg's drawings from the voyage had to be sold to Joseph Banks. During the next few years Forster undertook a variety of writing work, including a German translation of Thomas Pennant's Arctic Zoology. In November 1779 Forster was appointed Professor of Natural history and Mineralogy at the University of Halle, and director of the Botanische Garten der Martin-Luther-Universität Halle-Wittenberg, where he remained until his death. His Descriptiones animalium, completed within a month of returning to England with Cook, was eventually edited by Hinrich Lichtenstein and published in 1844. Forster's contributions to the Philosophical Transactions of the Royal Society (1772–73) on zoology, ornithology, and ichthyology established him as one of the earliest authorities on North American zoology. The standard author abbreviation J.R.Forst. is used to indicate this person as the author when citing a botanical name. ^ (in German) Dove, Alfred. "Forster, Johann Reinhold" in Allgemeine Deutsche Biographie, v.7 (1878), pp. 166–172. ^ (in German) Karl Ludwig Preuß: Dirschau's historische Denkwürdigkeiten. Für das 600jährige Jubelfest der Stadt (20. August 1860). Kafemann, Danzig 1860, pp. 39–44. ^ Iłowiecki, Maciej (1981). Dzieje nauki polskiej (in Polish). Warszawa: Wydawnictwo Interpress. p. 140. ISBN 83-223-1876-6. ^ "Foster, Virginia Viktoria". Stuttgart Database of Scientific Illustrators. Retrieved 4 September 2018. ^ a b Chisholm, Hugh, ed. (1911). "Forster, Johann Georg Adam" . Encyclopædia Britannica (11th ed.). Cambridge University Press. ^ One or more of the preceding sentences incorporates text from a publication now in the public domain: Gilman, D. C.; Peck, H. T.; Colby, F. M., eds. (1906). "Forster, Johann Reinhold" . New International Encyclopedia (1st ed.). New York: Dodd, Mead. ^ Forster, Johann R. 1771. A catalogue of the animals of North America. 'containing, an enumeration of the known quadrupeds, birds, reptiles, fish, insects, crustaceous and testaceous animals; many of which are new, and never described before, to which is added, short directions for collecting, preserving, and transporting, all kinds of natural history curiosities. B. White, London, England. 43 pp. 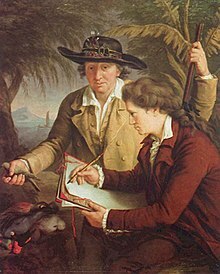 Johann Georg Adam Forster was a German naturalist, ethnologist, travel writer, journalist, and revolutionary. At an early age, he accompanied his father, Johann Reinhold Forster, on several scientific expeditions, including James Cook's second voyage to the Pacific. His report of that journey, A Voyage Round the World, contributed significantly to the ethnology of the people of Polynesia and remains a respected work. As a result of the report, Forster was admitted to the Royal Society at the early age of twenty-two and came to be considered one of the founders of modern scientific travel literature. Johann Matthäus Bechstein was a German naturalist, forester, ornithologist, entomologist, and herpetologist. In Great Britain, he was known for his treatise on singing birds. Ripogonum is a genus of flowering plants confined to eastern Australia, New Zealand, and New Guinea. Until recently this genus was included in the family Smilacaceae, and earlier in the family Liliaceae, but it has now been separated as its own family Ripogonaceae. The Norfolk kaka is an extinct species of large parrot, belonging to the parrot family Nestoridae. The birds were about 38 cm long, with mostly olive-brown upperparts, (reddish-)orange cheeks and throat, straw-coloured breast, thighs, rump and lower abdomen dark orange and a prominent beak. It inhabited the rocks and treetops of Norfolk Island and adjacent Phillip Island. It was a relative of the New Zealand kaka. The Tahiti rail, Tahitian red-billed rail, or Pacific red-billed rail is an extinct species of rail that lived on Tahiti. It was first recorded during James Cook's second voyage around the world (1772–1775), on which it was illustrated by Georg Forster and described by Johann Reinhold Forster. No specimens have been preserved. As well as the documentation by the Forsters, there have been claims that the bird also existed on the nearby island of Mehetia. The Tahiti rail appears to have been closely related to, and perhaps derived from, the buff-banded rail, and has also been historically confused with the Tongan subspecies of that bird. Adenostemma is a genus of flowering plant in the Asteraceae family described as a genus in 1775. It is widespread in tropical regions of Asia, Africa, Australia, the Americas, and various oceanic islands. Glaucus is a genus of small blue pelagic sea slugs. They are aeolid nudibranchs, ranging in size from 20 to 40 mm. They feed on colonial cnidarians such as Portuguese man o' wars, blue buttons, and purple sails. They can produce painful and potentially dangerous stings when handled, as they store the venomous nematocysts of their prey. Glaucus is the only genus in the family Glaucidae. It includes five species. Balanophora is a genus of parasitic plants in the family Balanophoraceae found in parts of tropical and temperate Asia, including the Malesia region, Pacific Islands, Madagascar, and tropical Africa. There are about 20 accepted species, including the newly discovered B. coralliformis. Many species emit an odour which possibly attracts pollinators in the same way that pollinators are attracted to Rafflesia. Balanophora fungosa, sometimes known as fungus root is a flowering plant in the family Balanophoraceae and occurs in South Asia, Southeast Asia, Australia and some Pacific Islands. It is an obligate parasite growing on the roots of rainforest trees. The flowering structure is shaped like a puffball but in fact consists of a globe covered with thousands of tiny female flowers. The globe is surrounded at its base by a much smaller number of male flowers. In flower, the plant emits an odour resembling that of mice. John Blackburne was an English businessman, landowner and renowned amateur botanist.